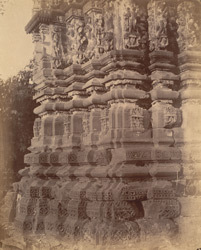 Photograph of the mouldings of the facade of the Mahadeva Temple at Pali, taken by Joseph David Beglar in 1873-74. Beglar described this Shiva temple,situated on the banks of a large tank at the south-west of the village, in his 'Report of a tour in Bundelkhand and Malwa, 1871-72; and in the Central Provinces, 1873-74' (A.S.I. vol. VII, Calcutta, 1878), p. 218, "...the mouldings are deep, bold and richly sculptured, and the two rows of statues running round are well executed and superior to the usual run of such sculptures in subject, design and in execution, there being no indecent figures; unfortunately, a thick coat of plaster and white-wash nearly fills up the hollows, and the delicately carved figures are only partially visible where time and weather, combined with the shock of falling blocks from the upper portions of the tower, have rubbed away the coating; the figures are smaller than usual, in reddish stone, well and carefully executed and probably once polished..."